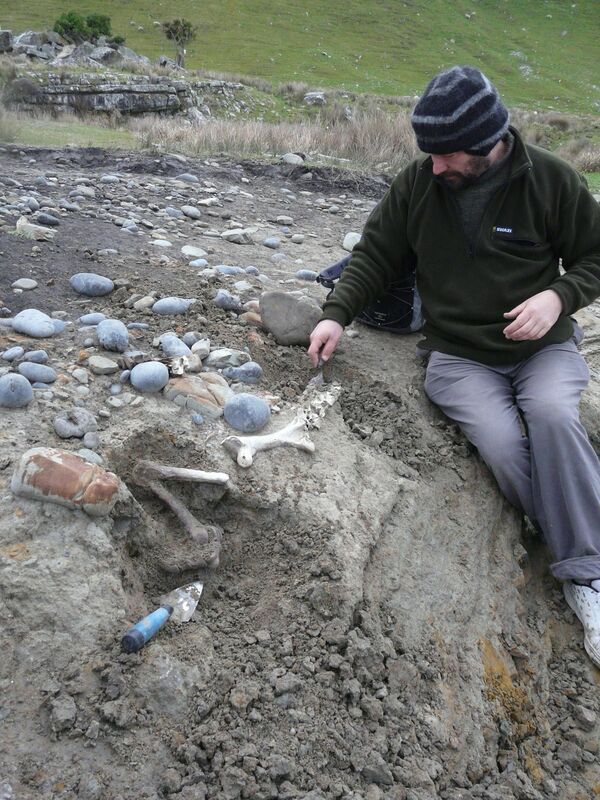 Fossil hunting along the rugged and beautiful Wairarapa coastline is a dangerous exercise. Prevail against the harsh winds that blow you off your feet and fossil penguins will be your reward – prehistoric nuggets of gold from a lost world that is only now yielding its secrets. Risking life and limb: At the rugged Te Kaukau Point, bones of prehistoric creatures from a lost world can be found eroding out of the coastal banks. Photo courtesy of Alan Tennyson. Alan Tennyson and Peter Clayworth are at Te Kaukau Point, looking for bones eroding out of the vertical coastal bank dissected by the 1718-year-old Taupo pumice layer. This line gives a good clue to the relative ages of bones above and below it. The stark, isolated Wairarapa coast is being constantly eaten away by the sea, erasing Aotearoa’s biological heritage. Regular expeditions are the only way to salvage what’s exposed from these rich deposits. Moa and fur seal bones are the most obvious – but there is a wealth of smaller bones that take more careful searching to find and even more patience to identify. Amongst the larger bones sticking out of the bank was the coracoid, (i.e. collar bone), of a large penguin. 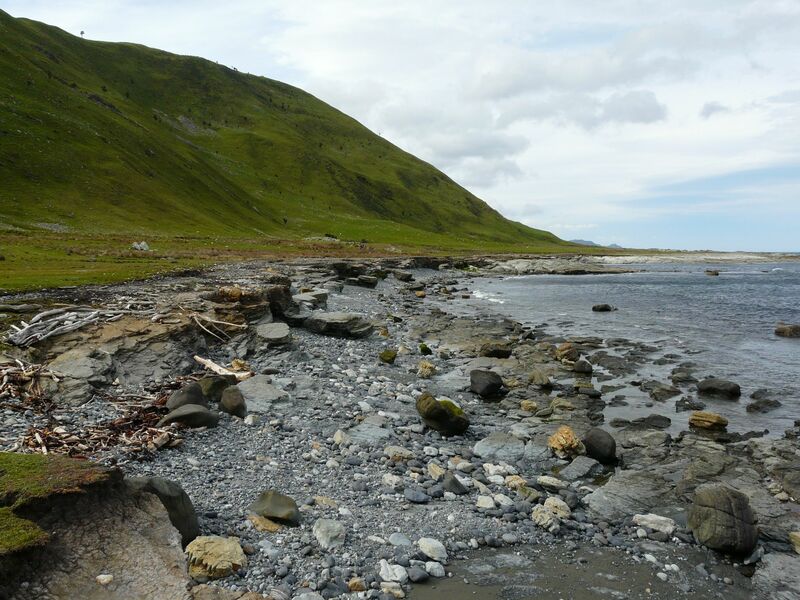 The discovery of any big penguin bone along this coastline is quite exciting. Alan compared the new bone with other penguin bones in Te Papa’s basement. Lo and behold, it matched the Waitaha Penguin (Megadyptes waitaha), a species of prehistoric penguin that geographically shouldn’t be there. Did this bone belong to a vagrant or was the bird part of a local breeding population? But why is this significant? Yellow-eyed Penguins/Hoiho (Megadyptes antipodes) are one of our natural taonga and have pride of place on our $5 note. They are also a major ecotourism drawcard, with thousands of tourists flocking to see them each year. Sadly, though, these avian megastars are one of the rarest penguins in the world. Just last week, it was reported that the Hoiho may be extinct on the New Zealand mainland within 10-20 years, if something is not done to halt their decline. It had until recently been assumed that the Hoiho was a remnant of a species that was more widespread when Polynesian settlers arrived in Aotearoa. Hundreds of Hoiho bones, morphologically identified by the bumps on their bones, had been found in coastal fossil deposits and prehistoric compost heaps across northern, eastern and southern South Island, and on Stewart Island. In 2009, our notion of this iconic bird was turned upside down. Otago University’s Sanne Boessenkool and colleagues, using ancient DNA and morphology, reconstructed Hoiho’s whakapapa and found all was not as it seemed. The fossil and prehistoric bones had come from a completely different penguin altogether, named Waitaha Penguin. The Hoiho, far from being a relic from a lost golden age, was now a recent ‘native invader’. Ghosts of penguins past: The Te Kaukau Point Waitaha Penguin coracoid, similar to this one in Te Papa’s collections, was the first clue this species called Te Ika a Māui home. Photo courtesy of Te Papa. Our new study, (with collaborators from Landcare Research, Te Papa and Canterbury Museum), using the bones that Alan risked life and limb to find on the rugged Wairarapa coastline, shows that Waitaha Penguin, far from being a South Island endemic, most likely also had sizeable breeding colonies in the lower North Island. 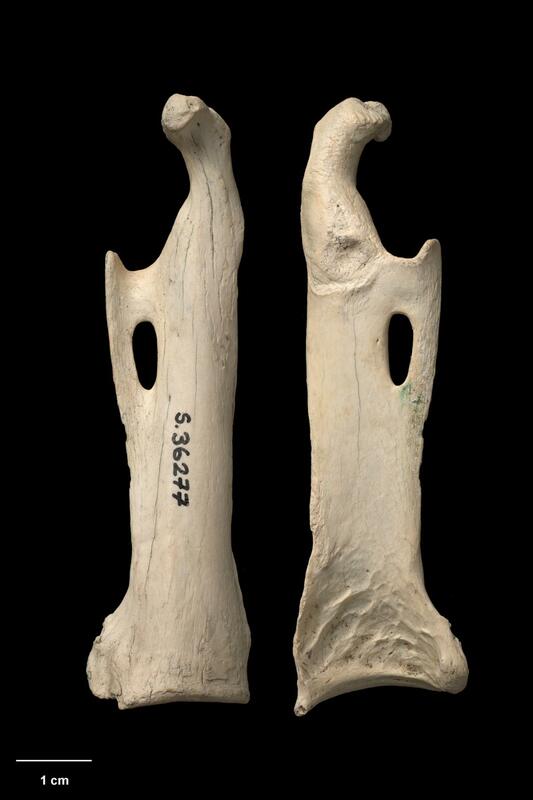 Hidden away in the fossil and archaeological collections of Te Papa were more skeletal ghosts of Waitaha Penguins. Many of them had been burnt and fragmented from being cooked in prehistoric fire pits/umu, or were masquerading as crested penguins. The numbers of Waitaha Penguin bones that Alan and I discovered in the collections were too numerous for them to be vagrants. So what happened to the Waitaha Penguin, and how does its existence change the conservation management of Hoiho? When Polynesians arrived in Aotearoa, Hoiho were restricted to the subantarctic Auckland and Campbell Islands, while New Zealand was home to Waitaha Penguin. Vagrant Hoiho occasionally arrived on the mainland, but they couldn’t speak the lingo, let alone get a job or a foot on the property ladder – the job vacancy (or niche) for a Megadyptes penguin had already been filled. Hunting, habitat destruction and predation soon changed all that, and like much of Aotearoa’s unique biodiversity, Waitaha Penguin went the way of the moa within a short timeframe. With New Zealand a ‘clean slate’, there was a job opening for a suitable replacement penguin. But it would take more than that for Hoiho to accept the niche offer. Hoiho can be thought of as ‘cold adapted’, compared to their ‘warm adapted’ Waitaha cousin. A generation after Waitaha Penguin’s demise, the Little Ice Age kicked in, which was to last several hundred years. This is the same Little Ice Age that resulted in the frost fairs on London’s frozen Thames. In the face of dropping temperatures (ideal for Hoiho) and no big game to hunt, most southern Māori retreated to areas north of Banks Peninsula where horticulture was possible. Further south, remnant Māori populations stagnated in Otago and the Foveaux Strait region was abandoned until the arrival of Europeans several hundred years later. Is it a bird? Revealing the secrets of Te Kaukau Point takes patience, as Peter Clayworth discovers while excavating a Stout-legged Moa. Sometimes ghosts from a distant past raise the odd conservation conundrum too. Photo courtesy of Alan Tennyson. Conditions were now primed for Hoiho to storm the beaches of a ‘cold’ New Zealand. Within 20-30 years, Hoiho had established in southern Aotearoa, in what has been described as one of the fastest biological turnover events ever documented. In this prehistoric ecoscantuary, where human pressure was greatly reduced, Hoiho bided their time and built up numbers. Despite this apparent ‘clean slate’, Hoiho did not recolonise the former range of their extinct cousin, no doubt due to a combination of physiological differences regarding climate resilience or increased human pressure outside the ecoscantuary fences. Indeed, this paradigm shift in thinking about one of our national icons raises important but uncomfortable questions we need to think about. Rather than burying one’s head in the sand, not wanting to admit that many of our natural icons are recent native invaders because it’s not good for conservation advocacy, we need to think and ruminate on how this changes conservation management of these precious taonga. Whether you ‘believe’ Waitaha Penguin and Hoiho are separate species, subspecies or genetic lineages, is purely academic – the tabled DNA evidence is irrefutable. What’s important is what was here when Polynesians arrived in Aotearoa – not what is here now. Hoiho’s status as a recent native invader raises the question of whether they have adapted to New Zealand’s ‘warm’ conditions or remain maladapted colonisers, a ‘cold’ loving species at heart. Hoiho have only been here a mere 500 years, a momentary blink on the evolutionary timescale for natural selection to act on. Hoiho on the mainland remained isolated from their subantarctic brethren; DNA fingerprinting, the same technology used in forensic science, shows the two populations have very little interaction. Aotearoa’s shores are still new habitat for them. The dramatic declines suffered by Hoiho over the past 20-30 years have been intimately linked with increasing sea surface temperature, though other threats loom large including predation, and downstream effects of land use effects and commercial fishing. It’s likely that many of the diseases afflicting Hoiho and the poor breeding years have an underlying climatic signal as well. 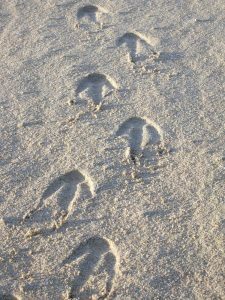 Ghosts of penguins future: If we can’t arrest the decline in Hoiho, all we will be left with are footprints in the sand, erased by the next high tide. Photo courtesy of Ingrid Hutzler. We can attempt to arrest this decline through community education, predator trapping, establishment of marine reserves, and changing fishing and land use practices, much like the use of antibiotics to kill a bacterial infection. But climate change is a completely different beast. We can only treat the symptoms. Like giving my kids Pamol when they are sick to decrease their temperature, it does not fix the underlying problem. By dealing with the threats we can control, Hoiho may have a few more years to adapt to their new and different world. Ecological baselines for Hoiho on the subantarctic islands are sorely needed, to compare to those further north, to track adaptation. If we lose Hoiho on mainland New Zealand, we don’t just lose a national icon, we also a substantial amount of the genetic diversity of the species. On a beautiful #DunnerStunner day, I’m at Katiki Point crouched down low watching Hoiho go about their daily lives. My four-year-old is enthralled, while my two-year-old excitedly points to the penguin and says ‘duck’ (his catch-all word for birds). Talking with my kids about the whakapapa of these precious birds, I’m reminded about the conservation conundrum we now find ourselves in. I, for one, would love to bring my sons back here to see the penguins, and in years to come I hope they will bring their own kids here too. If we want future generations to enjoy seeing Hoiho in the wild, doing nothing is not an option.